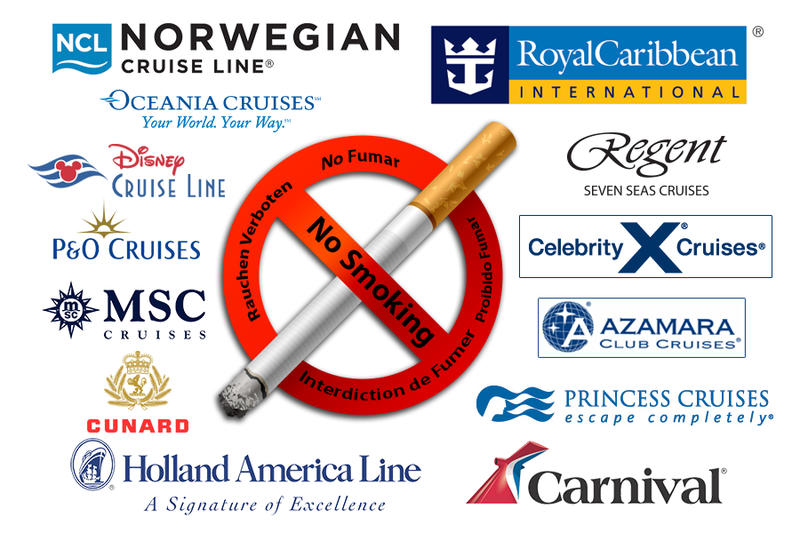 Cruise Lines No Smoking policies continue to grow are the cruising public demand a smoke free sailing. Several reasons fuel the reasoning for tightening the smoking restrictions ranging from the steady downward spiral of smokers that are kicking the habit, plus the 2006 wake-up call when fire broke out aboard Princess Cruises’ Star Princess. In that incidentNo-Smoking Policy one man lost his life when it was determined by an investigation, someone flicked a lit cigarette over their balcony railing, landing on a balcony below, igniting the furniture and balcony partition. The resulting fire spread to adjacent balconies and destroyed 238 cabins. Cruise lines find themselves walking a tight rope in the attempt to not alienate smokers and please non-smokers. With most cruise lines having put in place new stringent smoking regulations the penalties range from $250-$500 (cleaning fee) posted to their onboard account all the way to the possibility of disembarkation at the next port of call, depending upon the severity of the violation and the cruise line.